When you first meet Oluwagbeminiyi Osidipe, you encounter a very vibrant, friendly, and unique personality. Oluwagbeminiyi or Niyi – as she shortened her name for simplicity – was named by her mother, who had a “very personal experience” when she had her, Niyi explained. Niyi is a Yoruba Nigerian transplant who arrived in the U.S. in 2006. As one of the most densely populated (West) African countries, Nigeria derives its name from the river that spans its land. To the South, it borders the Gulf of Guinea to the Atlantic Ocean. Originally colonized by the British, Nigeria gained independence in 1960. Its main ethnic groups are the Hausa, Igbo and Yoruba, who speak English and their own respective languages, while major religions include Islam, Christianity and indigenous beliefs. Niyi shares her story, her views on politics, cultural differences she’s embraced with humor, and what we can learn from each other by expressing curiosity. Her message is simple: travel enriches us through its exposure to new cultures, and enables us to grow. “Travel is fatal to prejudice, bigotry, and narrow-mindedness, and many of our people need it sorely on these accounts. Broad, wholesome, charitable views of men and things cannot be acquired by vegetating in one little corner of the earth all one’s lifetime.” (American author Mark Twain, Innocents Abroad). Have you had the opportunity to travel (extensively, within your country, or even once abroad)? Can you relate to Twain’s sentiments? How does travel enrich us? Food has the wonderful quality of uniting us no matter where we are. There is nothing partisan or narrow-minded about food. It simply invites us to indulge, create recipes, and share with others. 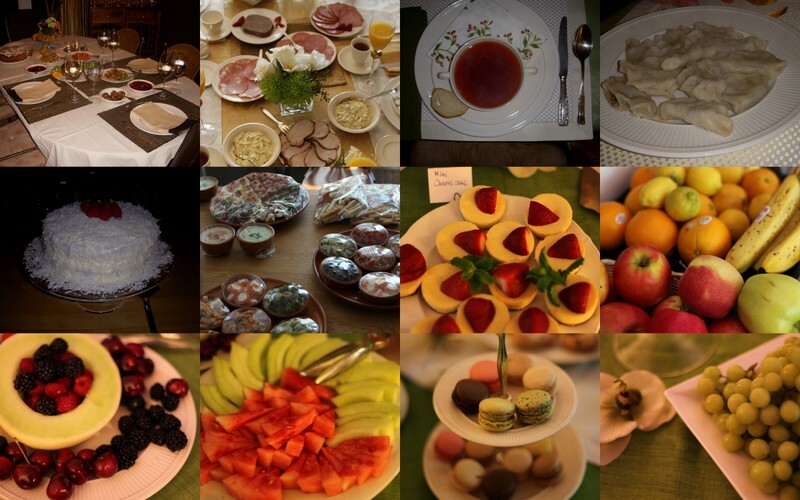 Two of my favorite Polish dishes (included in collage) are pierogies and barszcz czerwony – a beetroot soup – served on Christmas Eve in Poland. How does food bring us together? What are some of your favorite dishes and why? Can food trigger memories? It’s an early Tuesday morning. A few days after the horrific and daunting news of the Sandy Hook Elementary School shooting in Connecticut. The 24-hour media cycle documents eyewitness accounts, and social media updates commemorate the children, teachers, and notable staff at the school whose lives were taken. Beyond the stories and an ongoing gun control debate – with certain people reasoning that schools be better equipped for safety, and that teachers should carry guns… versus those enraged over the gunman’s ability to carry weapons that fired “hundreds of rounds,” and anger over the lack of monitoring of the gunman’s fragile mental state – there are families, eyewitnesses, and those of us near and afar, who are grieving. Grief is expressed through silence, anger, depression, sadness, and disbelief and much more. A feeling that someone was taken away from us too soon, and unfairly, often overwhelms. Yet even in time of despair, people find inner strength to replay vivid, happy memories in their minds. Grief is a universal feeling. It’s a part of life. We all experience it. I am still processing grief in the wake of the sudden death of my (young) cousin. I will always remember his happiness, his energy and his laugh that made him live to the fullest. The distance from the Netherlands – where I’m originally from – seemed immense when we first heard the news. Pearl Jam’s “Black” will forever carry a place in my heart as a song he loved. It still feels like a nightmare from which we all wish to wake up, but we are processing it by thinking of happier moments and good memories. How we choose to cope with the pain and loss is subjective. Many of us turn to family, friends, significant others, and sometimes even strangers who are experiencing the same pain to deal with our emotions. On Friday, the entire world shared grief with Newtown, Conn. Here’s a small glimpse of the worldwide reaction. Is this the time to discuss gun control in America? How is it viewed worldwide? Is the media frenzy harmful to those who are grieving – are interviews of surviving children exploitative or helpful? The answers to these questions vary from person to person. In my view, the subject of gun control has produced nothing less of a back and forth with no real solution in sight. Do I believe people should be banned from possessing guns or hunting? Absolutely not. In fact, I know people who own guns or hunt – but they have a level of responsibility. Tighter gun control laws would enforce stricter psychological screenings, and restrict access to weapons that fire excessive (hundreds) rounds to only trained (military) personnel – and more importantly, offer closer reassurance that guns don’t land in the wrong hands. Hi! I'm the founder of Culture With Travel and #CultureTrav. Please chat with us on social media and contribute in the comments! Enter your email address to subscribe to the blog and get new posts! Copyright © 2019 VictorThemes. All Rights Reserved.